In this chapter, we will describe performing routine index and cache management operations, back-up the system, and use tools that help Support team troubleshoots and fix problems. In Magento 2 default installation, the cache management system is an easy way to enhance the performance of your website. You can click the link to cache management and refresh the invalid caches instead of using the command code. The status of each primary cache and its associated tag displayed in the Cache Management page. Refresh your browser after clearing cache to see the most recent files. Cache Management Role Resources allows store administrators to assign access to specific cache maintenance actions to users. Mark the checkbox to select the cache you want to refresh, set the action to Refresh and click Submit. Set Mass Action to Select All or Select Visible, tick the checkbox of each cache to be targeted by the action, set action to refresh and click Submit. Remember to also clear browser cache. Select All Tick the checkbox of all caches. Unselect All Clears the checkbox of all caches. Select Visible Tick the checkbox of all visible caches. Enable Enables all selected caches. Disable Disables all selected caches. Refresh Refreshes all selected caches. Submit Applies the action to all selected caches. Flush Magento Cache Deletes all items in the default Magento cache (var/cache), according to their associated Magento tags. 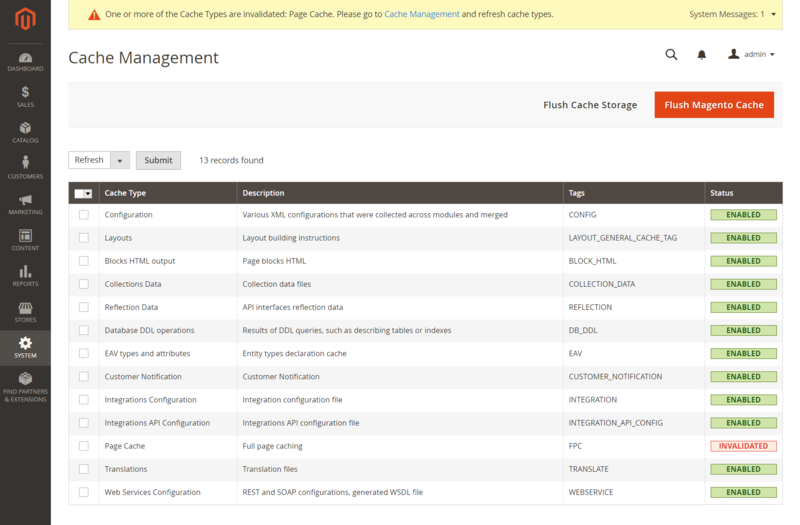 Flush Cache Storage Deletes all items from the cache, regardless of Magento tag. If your system uses an alternate cache location, any cached files used by other applications are removed in the process. Flush Catalog Images Cache Deletes all automatically resized and watermarked catalog images that are stored at media/catalog/product/cache. If recently uploaded images aren’t reflected in the catalog, try flushing the catalog and refreshing your browser. Flush Static Files Cache Deletes preprocessed view files and static files. Reflection Data Clears API interface reflection data, that is typically generated during runtime. Database DDL operations Results of DDL queries, such as describing tables or indexes. Customer Notification Temporary notifications that display in the user interface. Integrations API Configuration Integrations API configuration file. Web Services Configuration REST and SOAP configurations generated WSDL file.